The Turku Fair Center is easy to reach! The Turku Fair Center enjoys good traffic connections. It is located in the Artukainen district approximately 5 kilometres from downtown Turku, the railway station and port. The Turku Airport is only 15 minutes’ drive away. The street address of the Turku Fair Center is Messukentänkatu 9–13, but you can also access it from the side of Kirjaltajankatu or Artukaisten kiitotie. The Turku Fair Center is right next to the Gatorade Center. There are 3,000 parking places in the proximity of the Turku Fair Center. The customer parking lot is accessed from Kirjaltajankatu or Artukaisten kiitotie. 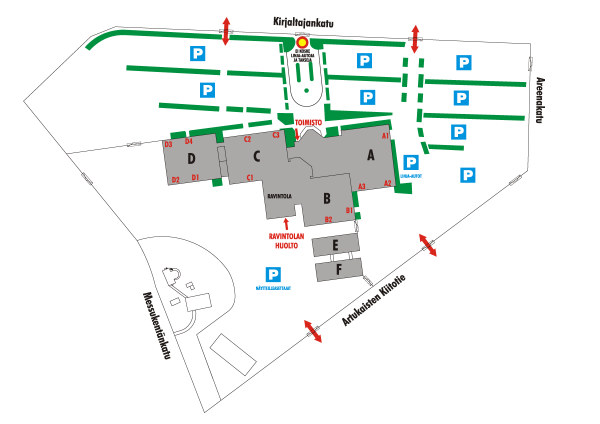 Exhibitors have a separate parking lot, which is accessed through a gate from Artukaisten Kiitotie. The bus schedule is planned separately for each fair and HK Areena event and published on the bus line 100 timetable page. The Turku Fair Center can also be reached with bus lines 32 and 99.